Whether you want to fully design your dream kitchen or want to utilize a pre-existing design, we offer a design service using 20/20 design software with High-Definition 3-D Rendering. When you are a customer with us, you have access to special pricing on appliances through our appliance suppliers’ partners. Because we have a variety of skilled workmen and craftsmen, we are able to complete all of the projects in your kitchen such as flooring installation, cabinet design and installation, countertop selection and installation, electrical repair and rewiring, plumbing reconfiguration, and even drywall repair. Whatever the scope of your kitchen project, we are here to guide you through the process to make it as convenient as possible around your schedule. 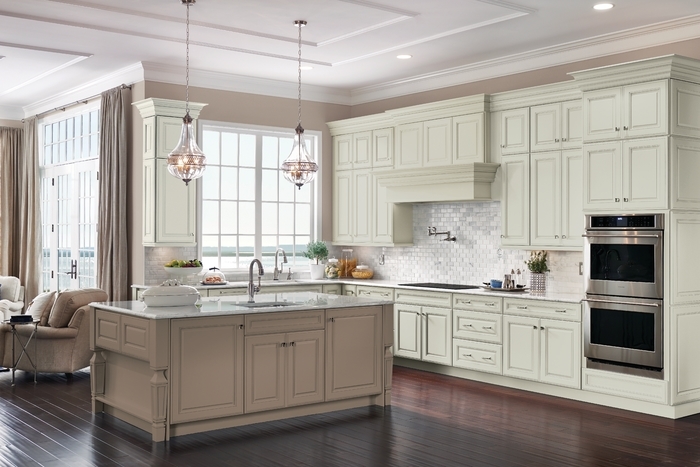 For your cabinets, we are able to offer you cabinets from companies including Kraftmaid, Merillat, Waypoint, and Platinum cabinetry , Once we’ve selected the cabinet, we will assist you with choosing your countertops from our wide array of choices including Quartz, Granite, Marble, and More. With the only Kraftmaid Design Studio in Texas, we can show you an accurate depiction of what your finished kitchen will look like. Based on your budget, we look forward to helping you design your kitchen to meet your needs and remain within your budget. Once installation begins, we will keep you updated on the project timelines and any issues that may arise. We offer a short-turn around for our installation time because of our utilization of state-of-the-art laser and water jet technology which allows us to achieve precise cuts and seams thus eliminating delays and errors. © 2018 Floor Accents All rights reserved.	"